Traction #85: Are Wide-Open Workspaces a Good Idea? Some seventy percent of all offices now have an open floor plan. The idea of an open floor plan was originally conceived by a team from Hamburg, Germany, in the 1950's. It was supposed to facilitate communication and the flow of work. But a growing body of research shows that the open office may well undermine the very things it was designed to achieve. In June of 1997, an oil and gas company in western Canada asked psychologists from the University of Calgary to monitor workers as they transitioned from a traditional work environment to an open floor plan. The psychologists assessed the following factors: employee satisfaction with surroundings, stress level, job performance, and interpersonal relationships. They took measurements at four weeks after the transition and then again at six months. Their conclusions were not optimistic. Apparently, employees suffered according to every measure. The new space was disruptive, stressful, cumbersome, and, instead of feeling closer, coworkers felt distant, dissatisfied and resentful. Of course, productivity fell. In 2011, the organizational psychologist Matthew Davis analyzed more than one hundred studies about office environments. He concluded that while the idea of an open office was meant to foster "a symbolic sense of organizational mission," making employees feel like they were part of a laid back, innovative enterprise, they were ultimately damaging to a worker's attention span, productivity, creativity and satisfaction. Compared with the standard work environment, employees in open works space environments experienced more uncontrolled interactions, higher levels of stress and lower levels of concentration and motivation. Psychologically, it's easy to understand the repercussions of open offices. Physical barriers are linked to psychological privacy. A sense of privacy boosts job performance. Open offices also remove the element of control, which in turn can lead to a feeling of helplessness. In a study that included companies as diverse as a Midwestern auto supplier to a southwestern telecom, it was concluded that the ability to control one's environment had a significant effect on team cohesion and satisfaction. Similarly, when workers couldn't change the way things looked, adjust the lighting and temperature, or choose how to conduct meetings, morale toppled. An open work environment may also have an impact on health. A study of some twenty-four hundred employees in Denmark revealed that as the number of employees working in a single room increased, the number of employees who took sick days increased, too. Specifically, workers in two person offices took approximately fifty percent more sick days than workers in one-person offices. Those who worked in fully open spaces were out an average of sixty-two percent more. But psychologists believe that the most problematic aspect of the open space office isn't psychological, but physical. In a word, noise. In laboratory settings, noise has repeatedly been linked to reduced cognitive performance. Psychologist Nick Perham studies the effects of sound on how we think. He found that office commotion impairs a worker's ability to recall information and even do basic arithmetic. This can be particularly detrimental to introverted people, who need solitude and periods of alone time to innovate. Noise may also take a toll on health. Cornel University psychologists Gary Evans and Dana Johnson found that clerical workers exposed to open office noise for three hours had increased levels of epinephrine, the hormone we often call adrenalin and associated with the so-called flight or fight response. They also found that people in noisy environments made fewer ergonometric adjustments than they would in private, resulting in increased physical strain. As a result, workers tackled fewer problems than they would if working in a quiet environment. They simply became less motivated and less creative. This suggests that “cube farms” might be the answer. Cubicle spaces began with the idea of liberation in mind, with adjustable three way walls that provide autonomy and independence. However, in a 2013 study cubicle workers had the highest rates of unhappiness with their work setup. Cubicles connote oppression and work instability, perhaps due to the success of the comic Dilbert and other pop culture pieces about the workplace. New modules have been designed by Steelcase, made of glass that is 100% soundproof and has changeable opacity for adjustable privacy, which provides a compromise between cubicle and open space. At $15,000 a pop however, this may not be a suitable solution for many. 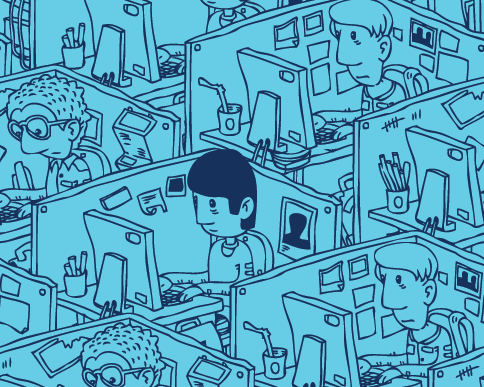 Could we be approaching the end of the open office work environment, as we know it? Is all this just more introspective psychological mumbo-jumbo? Who knows? But one thing is certain. Obviously, none of these people have ever set foot in an active advertising agency where, chances are, the exactly opposite conclusions are likely to be reached.